Tooth decay is the damage caused to the teeth by bacteria that produce acids and destroy the tooth. Tooth decay usually evolves into cavities which, left untreated, will lead to pain, infection and will ultimately cause tooth loss. Our dentists in Romania can give you a complete examination and offer you personalized advice for tooth decay prevention, based on your lifestyle and personal dental history. Cavities are usually caused by high levels of bacteria in the mouth and a diet based on products that can affect the tooth, like sugar and starch. Other habits, like smoking or drinking can cause tooth decay. A balanced and healthy diet is therefore the first step towards healthy teeth. Cavities can occur at any age and they are a common cause for tooth loss. Cavities begin to form when the hard structure of the tooth, the enamel, is softened and destroyed by plaque and tartar which contain bacteria. 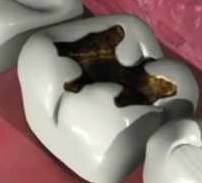 The acid continues to destroy each of the three layers of the tooth, all the way into the pulp, essentially creating a hole through the tooth. - spots on the teeth. Cavities may not be visible during a regular check-up. Our dentists in Romania can perform a dental X-Ray which will reveal if you suffer from cavities. You can take a look at our affordable services in Romania if you are planning a dental trip. Good oral care and avoiding certain foods are the two best ways to prevent tooth decay and avoid the formation of cavities. Our dentists can give you a personalized oral care plan and can offer you advice for a complete oral care: brushing, associated with flossing and using mouthwash. The treatment for tooth decay is determined according to the severity of the problem. Based on your condition, one of our dentists will choose to restore the tooth or remove it and replace it if it can no longer be saved. - tooth extraction: used as a last resort if the tooth is too damaged; missing teeth can be replaced with dental implants or with dental prosthetics. Our team of dentists in Romania is ready to help you schedule your dental trip to Romania. Please contact our dentists for more information about our services and prices.